In addition to insurance, Lijdsman Insurance Inc is an Alberta Authorized Registry Agent. 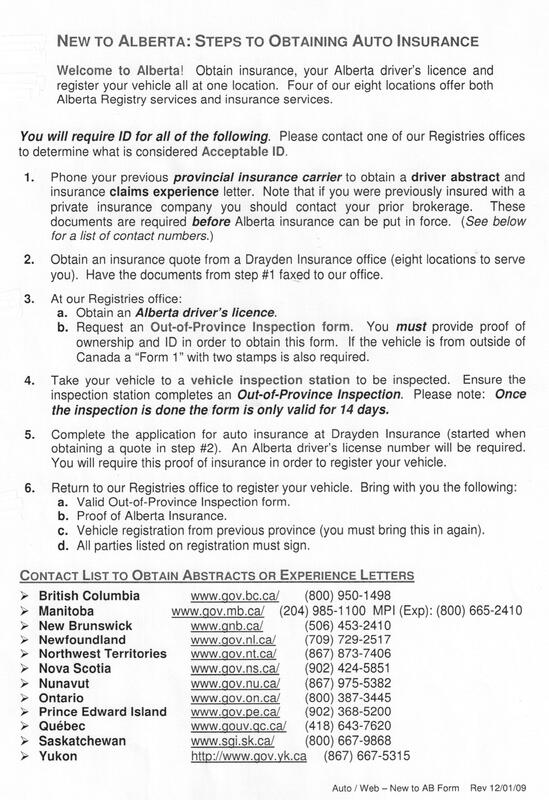 Your Alberta Driving record can be purchased for the past 3, 5 or 10 years; the cost for all levels is the same. If you are coming into one of our Registry offices, to purchase your own abstract, you will need to complete this Abstract form to receive a copy. If you are not able to have someone come in on your behalf, please send us an email and we will provide you with details on how to obtain your abstract. All Identification must be current and original. Identification must have a recordable number. Photo drivers licence from another jurisdiction. Photo identification card issued by another Motor Vehicle jurisdiction or government issued photo identification. Citizenship, Immigration, Naturalization, or Permanent Resident Card. Canadian Armed Forces Identification Card. Municipal, Provincial or Federal Police Force Identification. Alberta Health Care if your full name appears. Birth Certificate, Marriage Certificate. Issued by Vital Stats. Utility bill, telephone, gas or cable TV bill in applicants name. Notice of assessment from Federal Income Tax. Credit, debit or account card (must contain your name and signature). Cancelled cheques with imprinted name and address. Property tax bill or receipt, land title or mortgage documents. Insurance liability cards (pink cards). 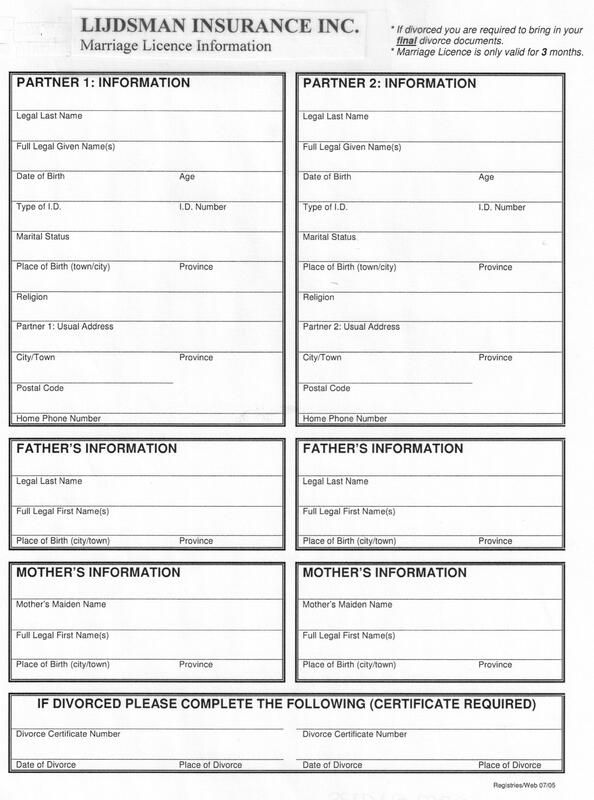 Complete the Alberta Birth or Death Certificate form, which can be obtained at any of our Registry offices or found on the Alberta Government Services website. Lijdsman Insurance provides corporate registry services. We can do searches, annual returns, trade names, and partnerships. Your physical & mailing address. Proof of Legal Presence in Canada. Proof of residency in Alberta. This must include your mailing address and you must provide a physical address. Full testing and issuing of a learning permit takes approximately 1 hour so you must be seated at a computer for testing 1 hour prior to closing. Testing available once a month. Contact Us for a detailed schedule. We can perform land title searches and order copies of documents. If you do not have the legal land description, we can assist provide you with that as well. If you have been divorced you must bring your final divorce “certificate” or “Decree Absolute”. Must be original document, photocopies are not acceptable. Please fill out our marriage licence application and bring it in with you. Click here for the form. Your physical and mailing address. Your licence from your previous Province or Country. Proof that you are lawfully entitled to be or to remain in Canada. Our staff are certified to do Personal Property searches. Provincial/Territorial Government issued birth certificate. Canadian Indian Status Card (Federal government issued). Student Authorization (Federal government issued). Employment Authorization (Federal government issued). Utility, telephone, gas or cable TV bill in client’s name. Current bank and/or credit card statements. Mortgage documents or residential lease containing a client’s physical address. Written confirmation of employment (on company letterhead, including contact name and telephone number). Written confirmation from an educational institution in Alberta indicating dependents are attending school. Mail from the federal government mailed to your Alberta Address. In order to register a vehicle that has last been registered outside of Alberta, you will require and Out of Province Inspection request. Bring into our registry office your previous registration that includes the serial number and we will provide you with the request that you will need to present to the inspection station. If your vehicle was last registered outside of Canada, you will also require your Form 1 (that you would have received at the boarder) with two stamps on it. You will have received one stamp from at the boarder crossing and the other from the Federal inspection station. Proof of Insurance: a Valid Pink Card is Proof of Insurance and is required for all Motor Vehicle services. Bill of Sale of lease, etc. If the Bill of Sale is in more than one name you will require both signatures to register. 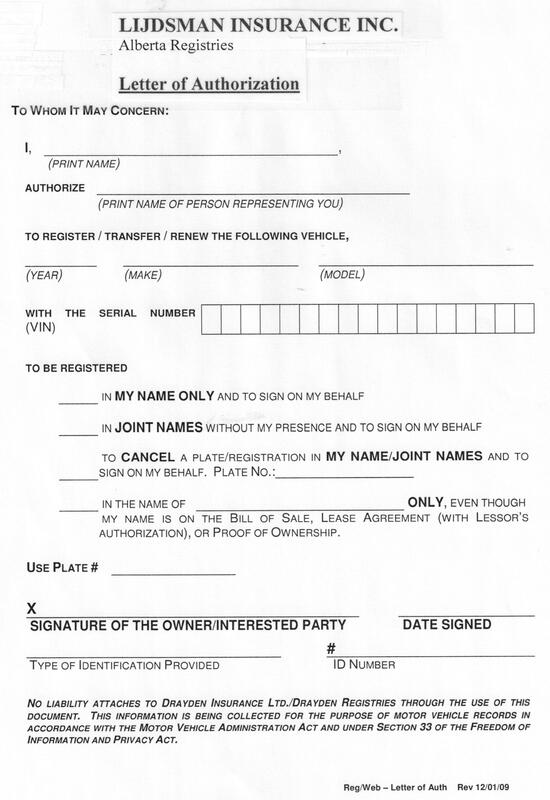 If someone else will be registering the vehicle for the owner, autorization in writing is required. Please complete the Letter of Authorization in our printable Forms section for the individual to bring with them.